Description: George Anson, commander of a Pacific squadron fitted out to raid Spanish possessions along the South American coast, left Spithead on 18/09/1740 arriving at the island of Santa Caterina, off southern Brazil, on 21/12/1740. 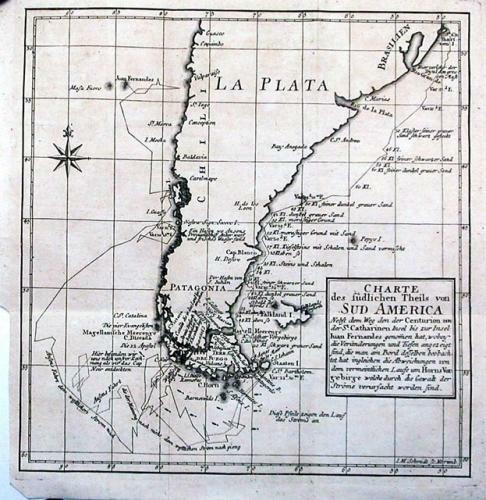 Leaving Santa Caterina on 18/01/1741 the fleet sailed south, rounded Cape Horn and arrived at the Juan Fernandez islands (Robinson Crusoe!) 09/06/1741. The chart shows the track of Anson's flag ship the Centurion and depicts the titanic struggle, he put up, to round the Cape. It took Anson 38 days to sail from the Le Maire Strait to Cape Noire. An extremely vivid chart.